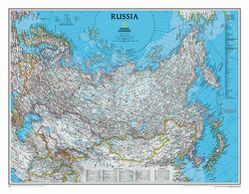 This current, wall map of Russia shows the provinces, cities, borders, roads, and natural features of this vast country. An ideal reference map of Russia. Available paper or laminated.